Judge Dredd, the Lawman of the Future certainly gets himself into some scrapes in the pursuit of justice in Mega-City 1. In his many years on the streets, he has fought a wide variety of foes including a future zombie version of himself, vampires, werewolves and even Santa, as well as the regular assortment of law breakers and perps. But some of his entanglements have definitely been odd, even for a guy who sees mutants and undead judges on a semi-regular basis. 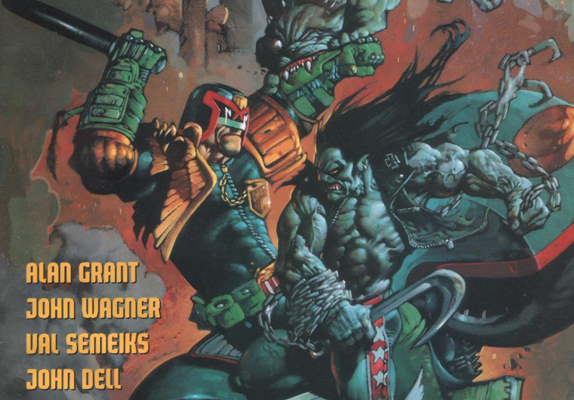 With the release of the new graphic novel Predator vs. Judge Dredd vs. Aliens out October 21 (today), it seemed just the right time to look at who else in the fandom universe Dredd has had the pleasure to kick around with. Recently collected into a trade paperback, these adventures have both Dredd and Batman turning up in numerous places (sometimes in Gotham, sometimes in Mega-City 1), having a tussle with someone (or each other) and then teaming up to solve a greater problem. In Judgment on Gotham, the duos’ first encounter used a dimensional portal to bring the two characters together. It works slightly better in this context because the Judge Dredd foes, The Dark Judges, used dimensional devices to first visit Mega-City 1, and Judge Death uses it here to go to Gotham City. Batman believes he has taken out the Judge and ends up accidentally transporting himself to Mega-City 1. After Judge Anderson clears up who Batman is, we get quite an adventure penned again by Wagner and Grant, with The Scarecrow and Judge Death teaming up to wreak havoc at a rock concert in Gotham. The Simon Bisley artwork really adds something special to the story and the way he draws Scarecrow and Judge Death makes them even more chilling than normal. The second book in the series, Vendetta in Gotham, has a fun (if slightly filler feeling) script by John Wagner and Alan Grant that actually uses this notion of superhero team-ups having a punch first, talk later policy to its advantage. This is seen in a nice plot twist halfway through the story which I will not reveal here, but it comes off as refreshing change, just like the villains, The Ventriloquist and Scarface, who are rarely used in such a way in the comics. This is all supported by Cam Kennedy’s great artwork in the book. 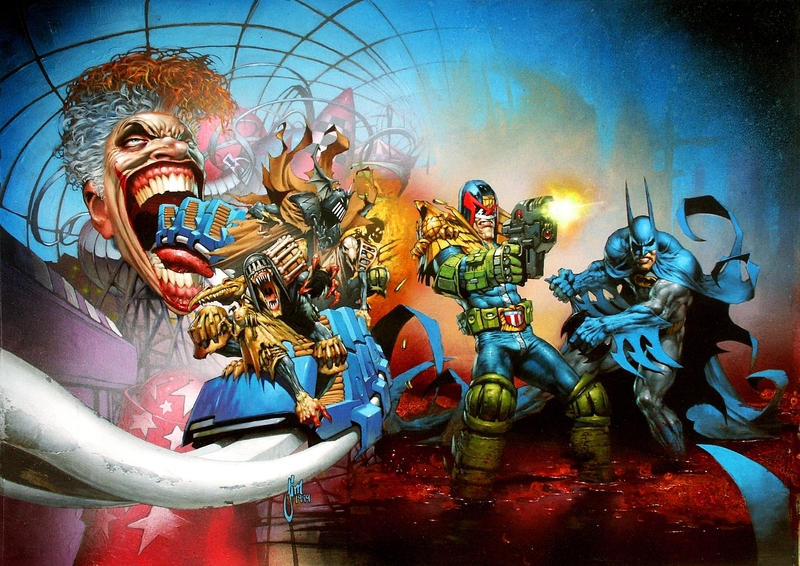 The last two entries are The Ultimate Riddle which has The Riddler getting in on the action, and the story throwing Batman and Judge Dredd into a gladiator styled battle arena, while Die Laughing had The Joker rehashing Scarecrow’s scheme, going to Mega-City 1 to release The Dark Judges with Batman hot on their tails. They were both fun in their own way, with some great artwork by Glenn Fabry and Carl Critchlow. However the stories never had the impact that the first two Wagner/Grant stories had. A little bit of fun but nothing too exciting, maybe the series team up had reached its natural end. Predator vs. Judge Dredd is a story with limited plot, but enough fun scenes to get it through. 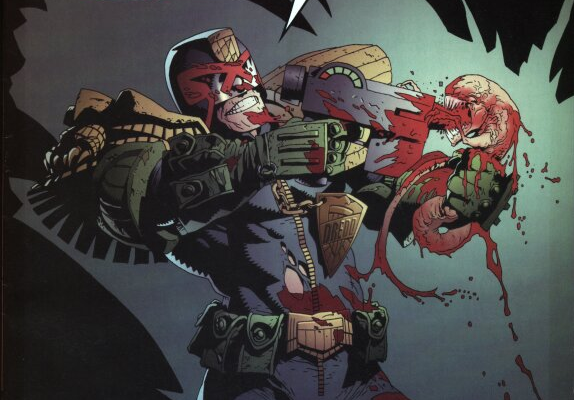 Basically it involves a Predator coming down to hunt the Judges, and Dredd has to get down and dirty to take him out. The book does stuff in some obvious links to the other films, mostly Psi Judge Schaefer, a relation of Dutch from the first Predator film. Then there is the scene where Schaefer drinks Predator blood to track him down which seems slightly silly but it mostly reads like a big action epic and is fun enough for that exact reason. 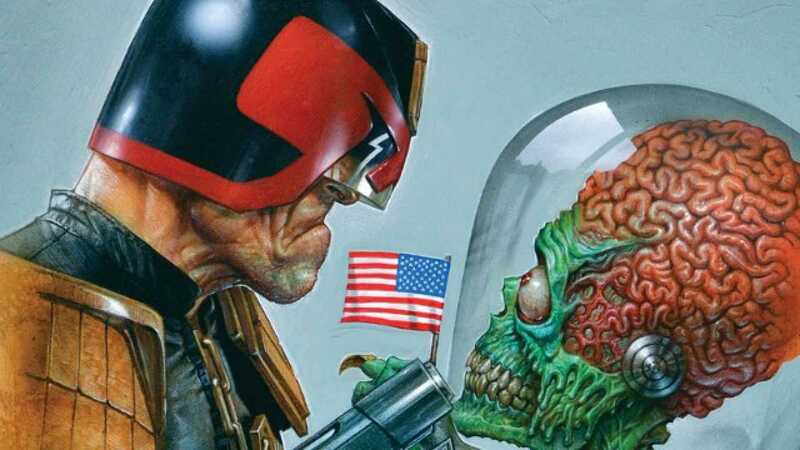 Judge Dredd has met a fair few alien creatures, some on vacation, some with mischief in mind and, in one instance, some used as muscle for the insane Chief Judge Cal in The Day the Law Died. So it was no great surprise that he would eventually tussle with both the Xenomorphs and Predators. 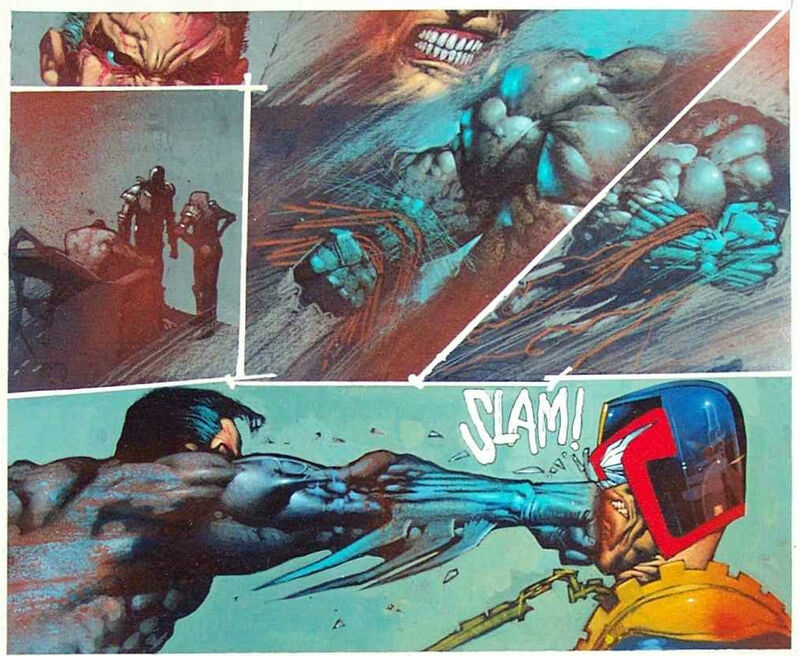 In Judge Dredd vs. Aliens: Incubus, John Wagner and Andy Diggle (writers) and Henry Flint (artist) do a great job at bringing the Aliens to Dredd’s world. When the usual stomach problems cause a chest burster to emerge out of a perp, it is up to Judge Dredd to try and keep the Alien infestation under control before they get loose and start impregnating the citizens. This all extends out into a bigger plot line and the reasons behind the Aliens actually arriving on Mega-City 1 are satisfying once revealed. With scenes ranging from the hospital where the chest burster first appears at, into the bowels of The Halls of Justice where something sinister is afoot, it all amasses to a fun read. There are elements of each of the first movies here, with Dredd having his own Verminators helping him to solve problems very similar to the marine help Ripley had in Aliens. The lead up to the hospital scene has the suspense of the original Alien movie stamped all over it. The only downside is that Dredd seems pretty much invincible here, with even acid blooded Aliens not giving him too much stress. However, when he meets the Predator, he has to go into full Arnold Schwarzenegger mode to take it down. Dredd did not stop there with the extraterrestrials. His next big meeting was in the IDW universe where he squared off against the Martians. In 2012, IDW started their own Judge Dredd comic, with a separate continuity, but by and large keeping with the general feel of the original UK comic books. Think ‘Ultimate Judge Dredd’ and you get the idea. IDW has recently become quite well-known for their lavish in-house crossovers. Infection 1 and 2 started the ball rolling, with zombies and Cthulhu-styled creatures appearing in comics published by IDW (Star Trek, Teenage Mutant Ninja Turtles, Ghostbusters, etc.). 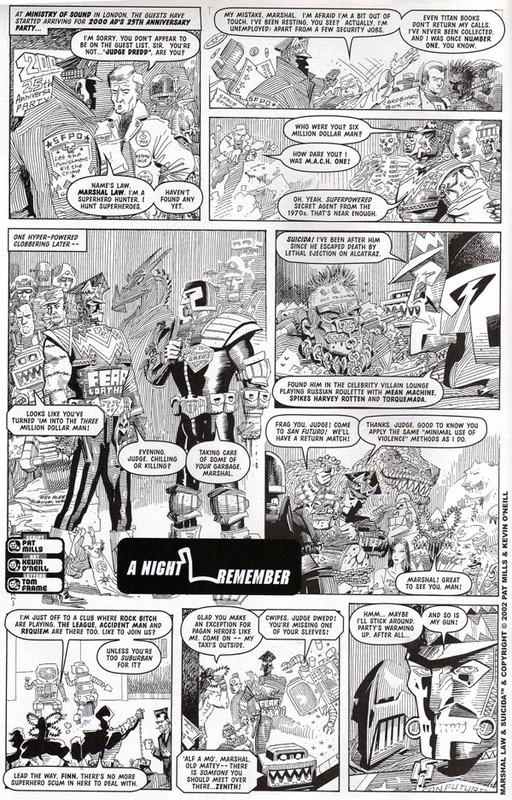 In 2013, their cross-over event was Mars Attacks, and while most comics had just one appearance in each of their issues, Dredd had his own mini-series involving the grotesque invaders. The plot is simple enough (a pattern we have seen before in these cross-overs with Dredd) with a search for a new mob leader that involves a former mob boss’ son turning up with some familiar looking aliens to back him up in his attempt to take over. Dredd gets roped into things when the sector house he is visiting is right in the middle of this mob takedown. Dredd, of course, then does his thing. Yet again there is not much story here, but what is on show works thanks to the Al Ewing story. Seeing these characters fight it out is lots of fun and the mix of violence and comedy flows together smoothly on the page, which was beautifully illustrated by John McCrea. Even after the Dark Knight and Alien invaders making appearances with Dredd, there are still a handful of others left that may be of interest. 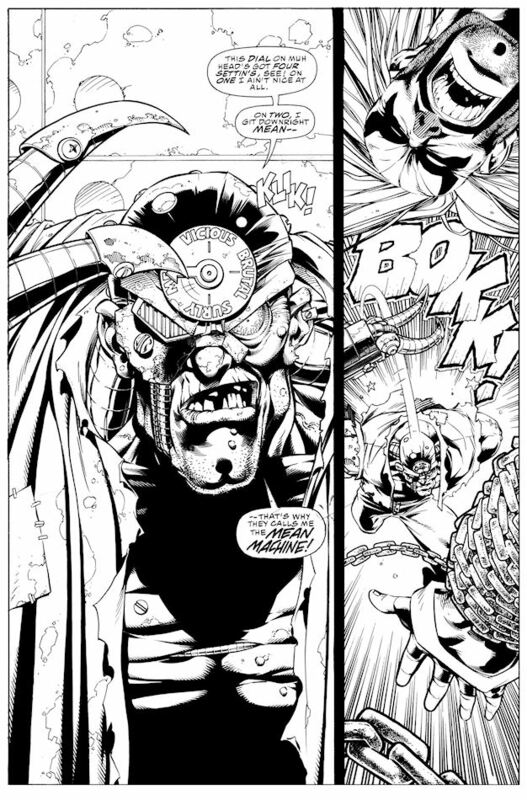 Judge Dredd vs. Lobo: Psycho Bikers vs. Mutants from Hell (1995) has Wagner and Grant reuniting for writing duties, with some explosive artwork from Val Semeiks tying it all together. Lobo meets Mean Machine and then Dredd has to get involved. You can pretty much guess the rest, as a lot of property damage gets done along the way! Great fun if you love Lobo as that sense of humor is spliced throughout this book, but Dredd fans may feel a little left out as sometimes it feels like the main man is running the show and he is just along for the ride. Still it’s a short read, so no harm. The 2000 AD anniversary issues are like having a little homage to all of the characters past and present, with a few short pages dedicated to self-mockery of said characters. These stories are normally very self-aware and have a tendency to wink at the audience to let you in on the joke. It is here in the 25th anniversary of the magazine, a meeting takes place, which would have made a darn fine comic, with Judge Dredd meeting Marshal Law, the hero hunting anti-hero. Though it is only a page long, it makes you think that the two would have teamed up for future endeavors rather than having the usual fist fight. Finally, there were two events that even the die-hard Dredd fans might have missed. One had him meeting with 1980s UK comedy performer Jeremy Beadle. whose wacky ‘caught on-camera’ pranks got the better of him in Mega-City 1, or when he appeared with Captain Britain, Dan Dare, Lenny Henry and Desperate Dan to celebrate the UK charity event Red Nose Day. That one is just plain strange! So what is left for Dredd? 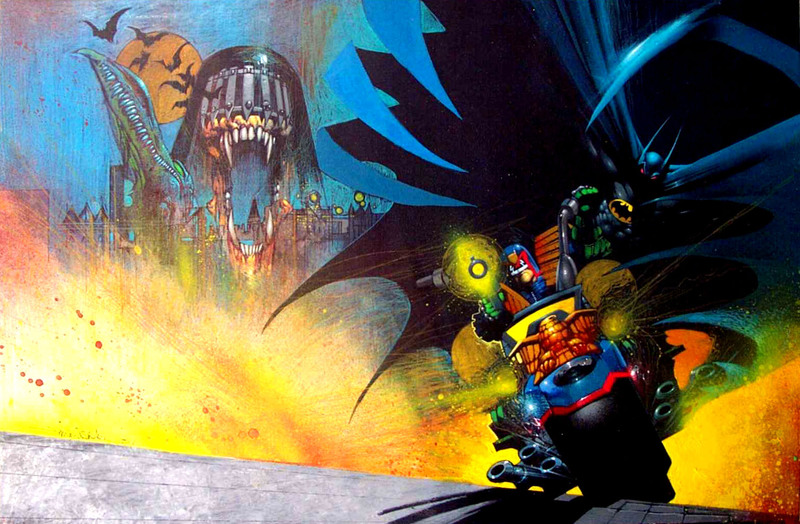 Well there are plenty of superheroes out there for him to team up with (or against), but also with the numerous versions of Dredd out there now (the Stallone movie version, the Karl Urban movie version, the UK comic version and the IDW comic version) it would be nice to see a cross-universe shakeup involving all the versions of Dredd turning up. Only the future will tell for sure, but if it does happen you can be sure Grizzly Bomb will let you know. If we left out any of your favorite Judge Dredd meetings, let us know in the comments section or on our Facebook page! Dark Horse Comics, IDW, Red Nose Day, Cartoon Aid.